Tuesday, April 19, 1904 began like many other days in downtown Toronto. The corner of King and Bay streets was a developed business district. But the day would soon take a turn for the worst. 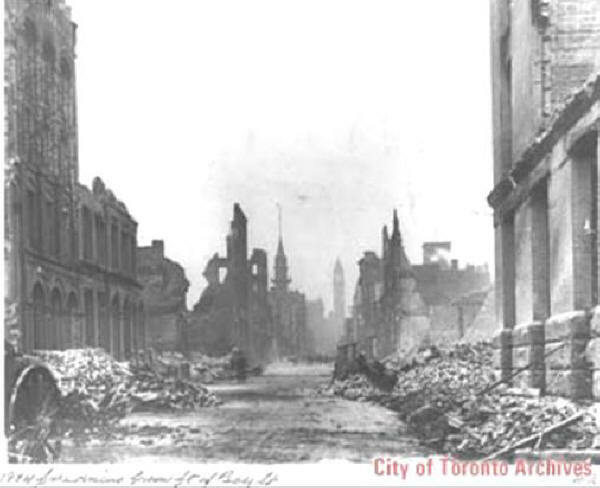 The Toronto fire of 1904 was a huge disaster. It was probably one of the single most important events in Toronto’s history to have shaped the development of building codes and regulations as they relate to fire safety in buildings. It was after this event that people realized building standards had to be improved and enforced. Here are the observations made about buildings after the Toronto Fire. Buildings need to prevent the spread of fire. Buildings need to withstand the effects of fire for a long enough period of time to ensure that fire fighters can get to the scene and contain the damage. Many buildings were destroyed during the fire not by the flames but by other buildings falling beside or near them. Buildings needed to provide an adequate means for the occupants of a building to escape. Since the Toronto fire of 1904, a number of standards and rules have been created and are identified in the National Fire Code of Canada and the National Building Code of Canada. Part 3 and Part 9 of the Ontario building code contain the main requirements used by designers for fire protection in and around buildings. Read 9.10 carefully. It can be complicated and difficult to understand when one applies the requirements to a specific building or site. Even today, industry professionals commonly make mistakes or oversights when it comes to applying the rules and regulations of Part 9 as it pertains to Fire protection. OBC 9.10.11.1. (1) & (2) require that a party wall located on a property line be constructed as a fire wall. The exception to this requirement is a building of residential occupancy with no dwelling unit above another dwelling unit. For instance a three storey single family dwelling could construct a party wall on the property line that is NOT a firewall. The party wall in this case would only need to be constructed with a one hour rated fire separation. If a firewall is required or if a firewall is used it must be designed according to OBC 3.1.10. One of the requirements of this Subsection is that the wall be constructed as masonry OBC 3.1.10.2.(3). Following on with the initial overview and analysis of a building in terms of Fire Protection and Construction requirements, read OBC 9.10.14, Spatial Separations Between Buildings. This analysis will yield pertinent information referring to the construction type of ‘exposing building faces' and the amount of windows allowed therein. What is the maximum amount of window openings that can be placed on the Wall A? What is the required FRR (Fire Resistance Rating) of Wall A? Is combustible cladding (such as wood siding) allowed on the exterior face? Does a party wall on a property line between two dwelling units that is required to have a 1 hour fire-resistance rating and be continuous from the top of the footings to the underside of the roof deck need to extend to the upper roof deck if one of the roofs decks is above the other in elevation. Normally a party wall on a property line has to be constructed as a firewall (Article 9.10.11.1.). Article 9.10.11.2. Firewalls not required is an exemption to this general requirement for party walls between residential buildings in which there is no dwelling unit above another dwelling unit. This exemption allows for a continuous 1 hour fire-resistance rated fire separation to be constructed between the units from the top of the footings to the underside of the roof deck. However, if the adjoining dwelling units do not have the same roof deck level, the fire separation must be continuous to the underside of the upper roof deck.